Window replacement should be done right the first time. Some homeowners, however, will attempt to replace their windows on their own. Renewal by Andersen® of St. Louis, a premier windows company in the area, explains why it’s better to entrust window installation to the pros. Without prior knowledge and experience, it will be difficult to remove your old windows and install new ones. In fact, you may end up damaging the window units if you don’t handle them carefully. Instead of doing it on your own, work with the experts to avoid the risks of botched window installation. You want your new replacement windows to perform as promised. This, however, won’t be the case when you attempt to install them by yourself. Plus, improperly installed windows can cause you more trouble in the long run and even result in premature replacement. Working with a professional window installer means the task will be done on time. They know exactly how to do their job, which makes the task easier. Entrusting the job to them can also help prevent disruptions. Many homeowners tend to venture in DIY window replacement because they want to minimize the initial expenses. This is a common mistake, however, that can may cause you to spend more money down the road. Unreliable DIY installation techniques, for instance, can cause your new windows to fail earlier than expected. 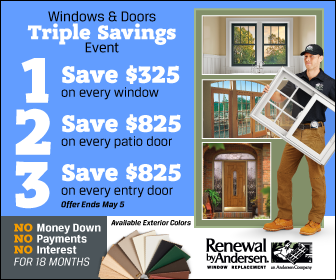 Count on Renewal by Andersen of St. Louis to provide durable and energy-efficient replacement windows and doors to help improve your home’s curb appeal and functionality. Call us today at (314) 332-2364 to learn more about our products and services. We serve residents of Missouri, including Chesterfield.